RIO DE JANEIRO: In Kyle Snyder made history at the Rio Olympics by becoming the youngest American wrestler to win a gold medal. The medal will soon be history as well, to be replaced by the IOC and Rio organizers because of damage. More than 80 American athletes have sent medals they won at Rio to US Olympic Committee headquarters to be shipped to games organizers, who will replace them due to flaking, black spots and other damage, the USOC said Tuesday. The Americans, including gold-medal wrestlers Snyder and Helen Maroulis, are among at least 100 Olympians from across the globe with defective medals. 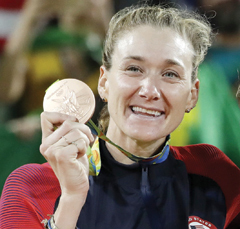 Beach volleyball star Kerri Walsh Jennings is also in the group; she says her bronze medal is flaking and rusting, and USA Swimming spokesman Scott Leightman said some swimmers have damaged medals as well. The USOC learned about the problems in December and reached out to all the American sports federations in January to begin the process. Rio Games spokesman Mario Andrada said officials have noted problems with the covering on 6 to 7 percent of the medals. “The most common issue is that they were dropped or mishandled, and the varnish has come off and they’ve rusted or gone black in the spot where they were damaged,” Andrada said. It’s not uncommon for medals to be passed around at post-Games parties and handled by hundreds. But this amount of damage is unusual. USA Basketball spokesman Craig Miller said the organization reached out to its players and seven – three men and four women – reported they believe there is an issue with their medals. Snyder, who wrestles for Ohio State, was 20 when he won his medal. He noticed an issue with the award the day after he won it. Rio de Janeiro spent about $12 billion to organize the games, which were plagued by cost-cutting, poor attendance and reports of bribes and corruption linked to the building of some Olympic-related facilities. Nine months later, many of the venues are empty and have no tenants or income – with the maintenance costs dumped on the federal government. In addition to the issues with the medals, which featured the Rio and Olympic logos, the local organizing committee still owes creditors about $30 million Greg Massialas, a national coach for the U.S. fencing team in Rio, said in a message to AP that the silver medal his son, Alex, won is damage free. He added that he hasn’t heard about any issues with other American fencers.